← Looking for an older post? I’d like to share a wondrous, and quite beautiful I think, example of our bodies’ abilities to self-heal. * Maybe this’ll provide a little inspiration for a post-dinner walk, too (I know it did for me). Let’s start with a little anatomy review. (If you’re all savvy on this, see you at the next paragraph that starts with a few stars *****): our physiology demands of our knees both stability and mobility. The knee, the tibio-femoral joint (the meeting of the femur of the thigh and the tibia which, along with fibula, are the bones of the lower leg), is known as a modified hinge. This means that it’s primarily a back and forth hinge (standing and sitting, jumping, anything linear), but also must have a little rotational ability (think the ability to turn your body while your foot is planted, like a quick turnaround while playing soccer; this rotation isn’t completely carried out through the knee, but certainly enough where it’s got to be able to turn a bit). To accomplish this, we see a really stunning arrangement, both in its thoroughness of territory covered and in its elegant relative simplicity. On the outside “shell” of the joint we have the dense ligaments LCL and MCL (you may’ve heard of the MCL before, usually relating to some accident). This shell keeps the knee not only from dislocating if someone tugs on your leg, but also from approximating (read: grinding) the femur and tibia. Inside this shell live the cartilaginous discs, the menisci, that further aid in this easeful glide of movement of the knee. Also, an “X” inside the joint capsule is comprised of two more ligaments, the PCL and ACL (the latter of which most people have heard, usually in a story that makes wince anyone who’s even mildly tweaked a knee). Also, bathing all of this connective tissue is the synovial fluid, which serves to lubricate and nourish the poorly-vascularized articular surfaces and connective tissue. The kicker is: if there was fluid everywhere, ballooning against every surface inside the knee, we’d have no mobility. Thus, there’s less fluid than space available. This is a key we’ll be back to shortly. *****Okay, we’re back! All this connective tissue needs to be very dense by design and thus lacks much notable blood supply. We don’t really think about this with an un-injured knee. We’ll probably think about it a lot if we wind up with a torn meniscus, as it’s blood supply that’s going to be your primary healing agent (side note: this is part of the philosophy behind an anti-inflammatory like ibuprofen: less inflammation = more blood flow possible). So we have this very dense, and in many ways quite vulnerable tissue, essentially buried inside a joint capsule with little or no blood supply to heal it. So, what’s a knee to do? Or, thinking evolutionarily, how can our form and function work most harmoniously? 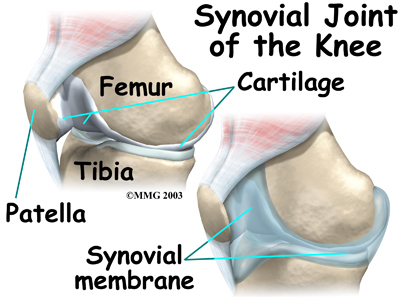 Dig this: the synovial capsule extends under the patella (the kneecap) and travels back between the little nobs on the ends of the femur to the back of the knee. And so … when you take a step, the knee straightens as the quadriceps tighten, which pushes the patella against the fluid underneath, which squeeeeeezes all the fluid toward the back of the knee, and past and into all the connective tissue;. In the next phase of your step, the push off, the musculature in your calf contracts, which squeezes the fluid back, again past all of these otherwise-never-touched cartilages. This continues all the way through the joint capsule until, again, the fluid rests behind your patella, awaiting your next step and flush of restorative fluids through the knee. What’s cool to note, too, is that this most efficiently happens while walking, more so than running or biking or rollerblading or whatever … We’ve had a long, long time to make this most basic of exercises work for us, and us for it.